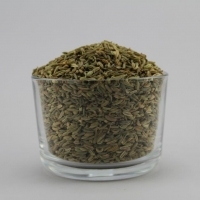 Fennel Seed is a aromatic anise flavored spice, brown or green in color when fresh, slowly turning a dull grey as the seed ages. Short on time? Let fennel sellers contact you. 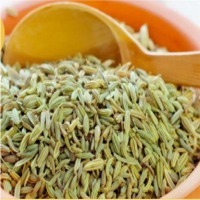 Fennel is an aromatic and flavorful herb that has several culinary as well as medicinal uses. If it is not in your kitchen cupboard right now, you’ll want to put it on your grocery list and make it a household staple after learning more about it. In addition to its popular use as a breath freshener, it helps relieve a number of ailments and facilitates better health due to its stomachic, carminative, antispasmodic, anti-inflammatory, antimicrobial, expectorant, diuretic, emmenagogue, depurative, anticarcinogenic and antioxidant properties. 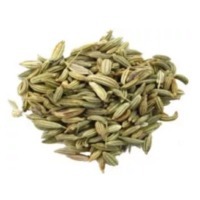 Fennel Seeds: Product Description: This herbaceous plant reaches up to 2 meters (about 6 feet) in height with deep green feathery (lacy) leaves and bears golden-yellow flowers in umbels. In general, fennel seeds harvested when their seed heads turn light-brown. The seeds, which closely resemble that of anise seeds in appearance, feature oblong or curved (comma) shape, about 3-4 mm long, light brown with fine vertical stripes over their surface. In general, fennels are harvested during the early hours of the day to avoid loss of seeds in the field. As in caraway, its stems stacked until they were dry and then threshed, processed before dispatching to the markets. Product Specifications: Admixture (%) : 0% Seed Style : Green Seeds Purity : 995 Color : Green Ash % : 0% Type : Spices Seeds Moisture (%) : 11% Grade : A Shelf Life : 2 Years Product Type : Spice Variety : Other Cultivation Type : Common, Organic Weight : 1 Ounce (oz) Imperfect Ratio (%) : 1% Drying Process : Sun Trade Information: Payment Terms : Paypal, Western Union, Telegraphic Transfer (T/T), Letter of Credit at Sight (Sight L/C), Letter of Credit (L/C), Cash Advance (CA) Packaging Details : 25-50 KG PP Bags Delivery Time : 15 Days Certifications : IEC, SPICE BOARD, APEDA Sample Available : Yes Main Export Market(s) : Africa, Middle East, Western Europe, Eastern Europe, South America, North America, Central America, Australia, Asia Sample Policy : Free samples available with shipping and taxes paid by the buyer Supply Ability : 30000 Per Week FOB Port : Mundra, India Main Domestic Market : All India Medical / Health Benefits: - Fennel has long been used as a remedy for flatulence and indigestion in traditional medicines. 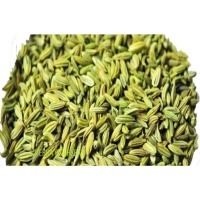 - Fennel seed decoction or added as a spice in food has been found to increase breast milk secretion in nursing mothers. - Fennel water often is used in newborn babies to relieve colic pain and help aid digestion. 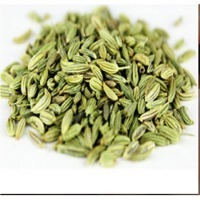 - Fennel seed oil is used to relieve coughs, bronchitis and as a massage oil to cure joint pains. 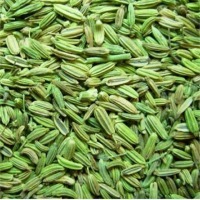 Fennel Seeds Fennel is grown largely in Gujarat, Rajasthan & Uttar Pradesh. Growing season is during August and December. 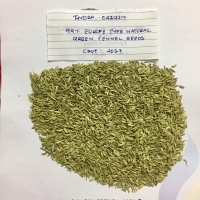 India being the world largest producer of fennel seeds dominates in the world market with major export markets at USA, Singapore, UK, UAE, Sri lank, Malaysia, Saudi Arabia & Japan. Different Qualities: 98% to 99.5% purity, Machine clean and Sortex varieties. 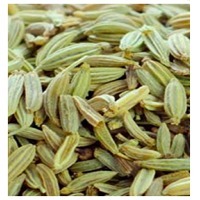 Fennel Seeds (Foeniculum Vulgare) Fennel seeds are the dried fruit of Foeniculum vulgare, which belongs to the parsley, family; it yields both a herb and a spice. It is oval in shape and green or yellowish, brown in colour. Fennel is highly aromatic and flavourful herb with culinary and, medicinal use. It is traditionally considered one of the best herbs for fish dishes., Fennel is cultivated largely in Gujarat, Rajasthan & Uttar Pradesh. Specifications :- Type : Singapore Quality, Europe Quality Purity : 99%, 98%, 97% Flavour : Aromatic sweet Moisture : 10-11% Max Look forward hearing from you soon. 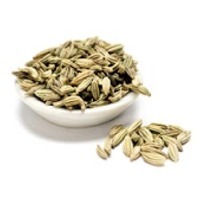 Fennel seeds may be yellowish or green in appearance. These seeds are very rich in minerals including magnesium. Seeds may be chewed upon after every meal or even more often. About 2-3 Gms may be had at a time and chewed upon. Daily intake about 7 Gms. (or 1½ teaspoon). 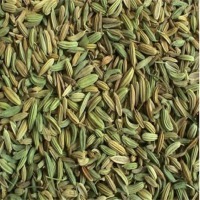 Fennel Seeds are known as Sounff or Variyali in India. 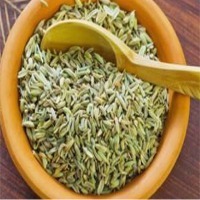 Fennel Seeds, which grow well in mild climates, are an oval, green or yellowish brown dried aromatic ripe fruit of an herbaceous plant called Foeniculum Vulgare, a member of Parsley family. Fennel is widely used in Asian, European, Italian and Mediterranean dishes. 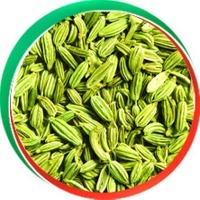 In India fennel is widely used in meat and seafood dishes and are also used with pickles and vinegar for a special flavor. 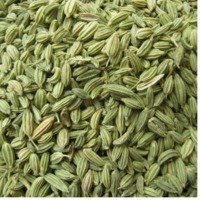 Fennel Seeds in raw or in roasted form is widely used in India as a mouth freshener especially after suppers. It is a highly aromatic and flavoured herb with culinary and medicinal uses, and along with the similar-tasting anise; is one of the primary ingredients of absinthe. 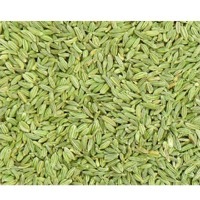 Tierra Overseas is processor and supplier of Fennel Seeds in India. Biological Source : Foeniculum vulgare Family : Umbelliferae Culinary Use of Fennel Seeds The bulb of the fennel plant can be prepared and eaten. Fennel can be braised, grilled, sautéed or sliced thinly and served in salads. The stalks of the fennel plant can be cooked or eaten raw as well. Fennel stalks can be used for making vegetable stock. 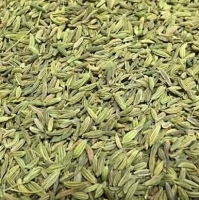 The seeds of the fennel plant can be used as a spice, either ground or whole. 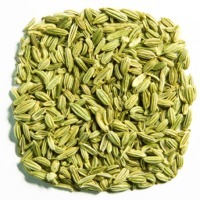 Fennel seeds are featured in Indian, Asian and Middle Eastern cooking. This ingredient is frequently used in making sausages. 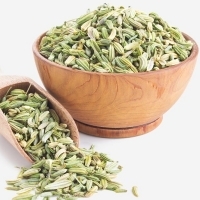 Fennel seeds are one of the five ingredients in the traditional Chinese five spice blend. 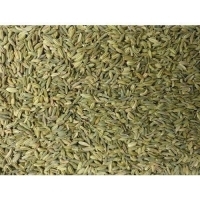 Fennel seed is also one of the ingredients used in making absinthe. Origin: Bulgaria Moistute: max. 12% Oil content: max. 4% Foreign admixture (seeds): 0.01% per kg Appearance: whole, clean seeds Colour: green, light brown.